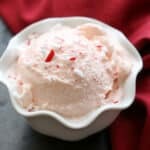 Homemade Peppermint Ice Cream. This is some of the creamiest ice cream I have ever made and for the record, it is nothing like the mint flavored ice cream you can find in a store. Pure peppermint deliciousness from start to finish without even a hint of a chemical or mass produced flavor. This Peppermint Ice Cream is surprisingly light, sweet, and minty. I think I dipped a spoon into the freezer container about 15 times the first time I made this and I’m not even a huge fan of peppermint! 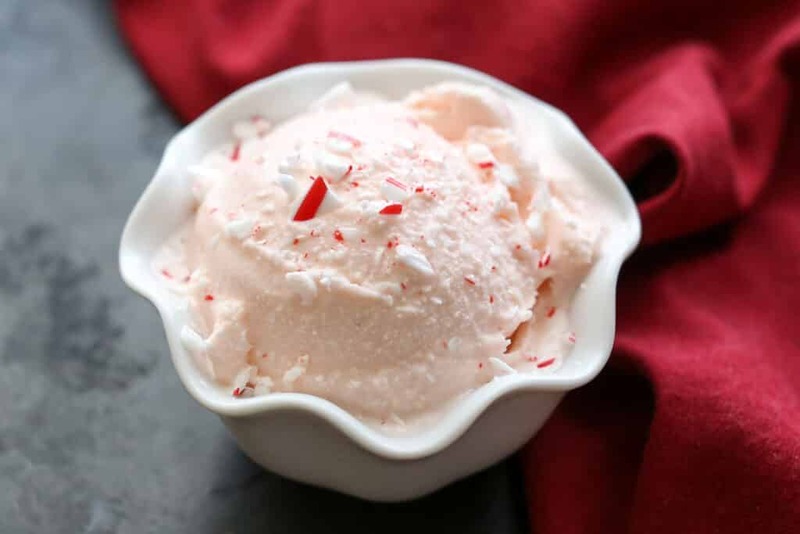 Peppermint Ice Cream is a spectacular combination of winter flavors and summer refreshment. 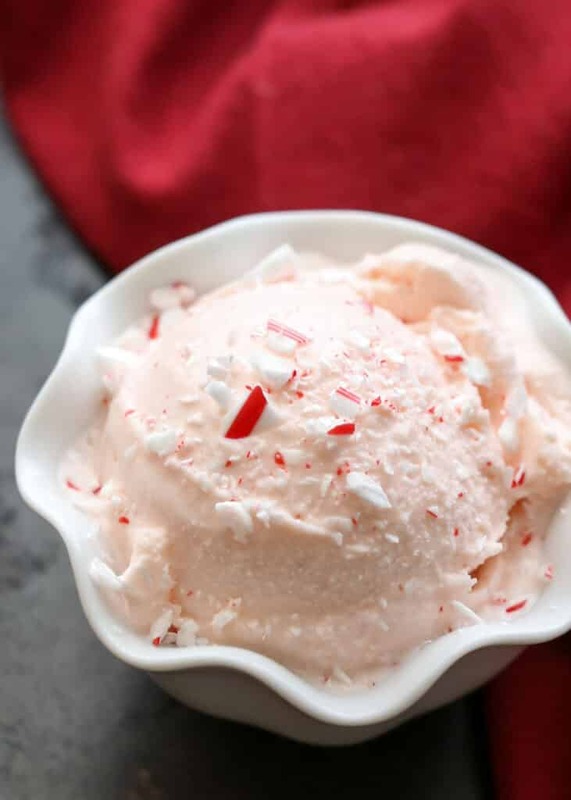 I can promise you now that I’ll be making this Candy Cane Ice Cream in June, just wait. I’m trying, I really am, but there aren’t even words to describe how fantastic this ice cream is. If you hang out with me on Instagram, you may already know that it blew my mind last week. I’m still so impressed with this ice cream, I’ve made two more batches just to share it with friends. Place the candy in a food processor or blender and pulse until the candy is broken down into powder. Whisk together the cream, milk, sugar, vanilla, peppermint extract, and salt. Add the crushed candy and whisk until mostly combined. Pour into your ice cream maker and process according to the manufacturer's instruction. Serve immediately for soft serve ice cream or transfer to an airtight container and freeze until firm. Enjoy! Learn from my mistake and be careful to use PURE Peppermint Extract, read the ingredients and make sure you have only peppermint in the extract. I accidentally bought a Pure "Mint" Extract a while back and it is a blend of spearmint and peppermint. Lovely fragrance, but unfortunately, it left my chocolate bark tasting like a pack of chewing gum. « Favorite Things ~ Anolon Pans Giveaway! This needs to be heated on the stove. Then chilled for several hours. It did not freeze in my ice cream maker. I've made this ice cream many times and it has frozen fine. Heating and chilling the ice cream does not affect the way the ice cream freezes in the machine. I can't imagine a reason why these ingredients wouldn't have frozen. I've never used the frozen bowl on the Kitchenaid mixer, so I can't speak to how well that would work. The whipping cream vs heavy cream shouldn't have affected it that much. It still should've thickened nicely. Mine didn’t freeze either. I use 2% milk but nothing else was different. I made this for my family’s Christmas dessert, and it was a smashing success! Followed the directions and made it in my ice cream maker one day in advance. Come Christmas evening, the ice cream was a perfect consistency — smooth and easy to scoop — and tasted light and pepperminty. I love that it was not a heavy custard base. I’ll be visiting your site again for these lovely non-custard ice creams!! Just made this for Christmas today and it was delicious! It froze up just fine in my ice cream maker. My kiddo REALLY enjoyed it! He says he loves it better than Braum's peppermint ice cream. This tasted really good, but turned out really soft. It seems to me that ice cream always turns out better when you add eggs. It was really good in coffee, though, or in other things where texture matters less.